When you need sharp equipment, you needed it yesterday. 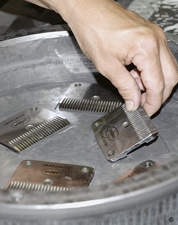 Premier provides 24 hour turnaround of your blades, combs and cutters (allow an extra day in June, July and August). How good is our service? The number of blades, combs and cutters that we sharpen is now tens of thousands a year--and growing rapidly. The rising demand speaks to the skill of our technicians and our service. Large blades are sharpened on a $65,000 automated lapping machine (we never grind them). The result is equal to (or better) than new. Combs and cutters are done on a high speed grinder. Beware: Blades, combs and cutters can be easily damaged (and even ruined) during sharpening by those without proper machines or methods.